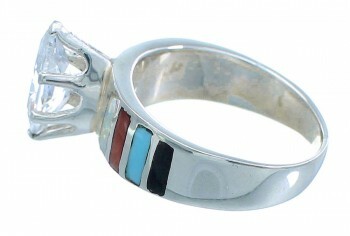 Sterling silver, Cubic Zirconia, Turquoise, Red Oyster Shell, Opal, and Black Jade. 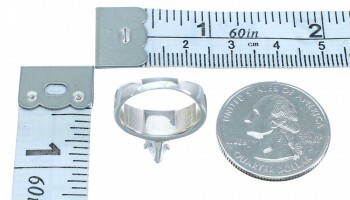 Ring is size 4-3/4, it measures approximately 3/8" long and 3/4" wide. You will absolutely fall in love with this gorgeous ring! 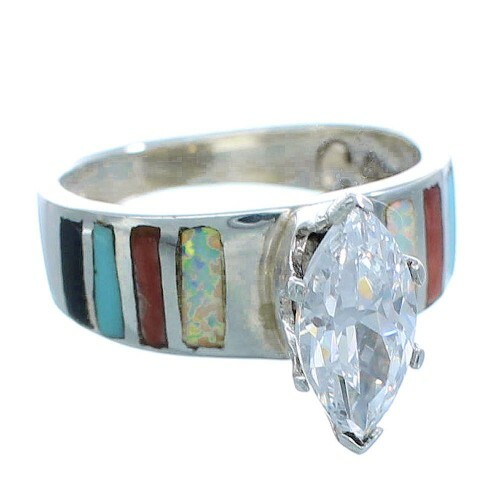 This piece of jewelry is hand made, out of genuine sterling silver, along with a Cubic Zirconia and multicolor inlay. The inlay consists of: real Turquoise, Red Oyster Shell, Black Jade, and man made Opal. The band is highlighted with multicolor inlay that is beautifully set, while thin silver lines can be seen highlighting in between and adding style. 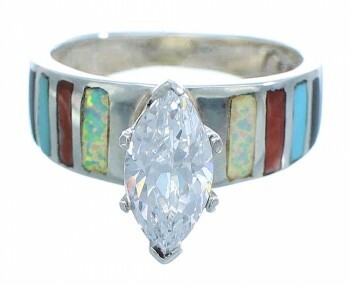 The stone is carefully set into a lovely prong setting, while being accented with inlay. Ring is stamped sterling and hallmarked.